On Thursday, the deadline for the federal government to publicly release all of its files relating to the JFK assassination arrived and, for a moment, it appeared that it would actually happen. But at the last minute, President Trump delayed the release of the most sensitive files. As expected, intelligence agencies insisted further review was necessary. Still, we did get thousands of newly public records, and analysts are pouring over them. Here’s everything that’s going on. In 1992, Oliver Stone released JFK, a film that chronicled the true story of Jim Garrison, a Louisiana District Attorney who popularized many of the most persistent conspiracy theories about the 1963 assassination of President Kennedy. A delirious blend of historical fact about Garrison’s investigations into a cover-up orchestrated at the highest levels of government and other conspiracy theories that had cropped up over the years, the film was a phenomenon. The hallucinatory three-hour opus made over $200 million and was nominated for eight Academy Awards. And the US Congress took notice of the corrosive effect it was having on the public’s trust of its own government. John Glenn, the first American astronaut in orbit, was serving as a senator from Ohio in 1992 when he introduced the President John F. Kennedy Assassination Records Collection Act. The legislation mandated that an independent review board collect all documents relating to the assassination from the National Archives and Records Administration and that those records be “publicly disclosed in full, and be available in the Collection no later than the date that is 25 years after the date of enactment of this Act.” In its final report, the review board mentioned Stone’s film multiple times. At one point the report states that “Stone suggested at the end of JFK that Americans could not trust official public conclusions when those conclusions had been made in secret” and “the American public lost faith when it could not see the very documents whose contents led to these conclusions.” The purpose of releasing the records publicly, on October 26th, 2017, was to help restore that lost faith, and ensure that Americans would be informed on what its government is doing when proper national security concerns had passed. In the meantime, conspiracy culture has gone mainstream. According to a 2013 Gallup poll, most Americans don’t believe that Lee Harvey Oswald acted alone when he shot JFK. A cottage industry of books, films, TV shows, and websites have cropped up pushing wild theories about government cover-ups on everything from aliens to 9/11. Fringe figures like Alex Jones have gone from sneaking around Bohemian Grove and warning about the mind-controlling powers of fluoride, to interviewing future presidents. Trump himself rode conspiracy theories into the White House. He first became a political figure by charging without evidence that President Barack Obama wasn’t born in the US, a claim that he doesn’t want to talk about anymore. But he’s put forward fresh conspiracies since then, including an implication on the campaign trail that the father of Senator Ted Cruz, his opponent for the Republican nomination, was involved in the assassination of JFK. It’s an accusation that Cruz was asked about as recently as yesterday, and Trump has never fully put to rest. For the contingent of conspiracy lovers who saw Trump as one of their own, and elected him as a man who’d finally reveal the corruption in Washington, the scheduled release of the JFK files was a moment for Trump to make good on his persona. Trump had to decide by Thursday if he’d let the legally required info dump go through or if he’d sign an order delaying the release over national security concerns. In the lead up to the deadline, conspiracy pushing supporters like Alex Jones’ InfoWars site and Trump advisor Roger Stone were already providing cover in case he decided to not go through with the release. Stone insisted that the “deep state”—the intelligence community—wouldn’t let Trump go forward. InfoWars has pretty much given Trump a pass on anything he does because he’s being drugged by nefarious figures in the government, so whatever happens, it won’t be his fault. But Trump slapped down naysayers the day before the deadline when he tweeted, “The long anticipated release of the #JFKFiles will take place tomorrow. So interesting!” They weren’t. The American public expects — and deserves — its Government to provide as much access as possible to the President John F. Kennedy Assassination Records (records) so that the people may finally be fully informed about all aspects of this pivotal event. Therefore, I am ordering today that the veil finally be lifted. A 338-page file on J. Walton Moore, the head of the CIA office in Dallas at the time of the killing, and an 18-page dossier on Gordon McClendon, a Dallas businessman who conferred with Ruby just before he shot Oswald. Several files on notorious anti-Castro Cuban exiles were apparently withheld, including those focusing on Luis Posada and Orlando Bosch, who had been accused of a 1976 airline bombing that killed 73 people. 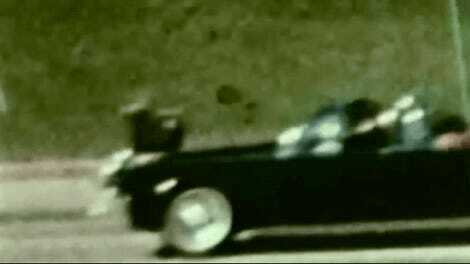 Researchers had hoped the release would shed new light on Oswald’s movements and contacts in the months before he shot Kennedy. 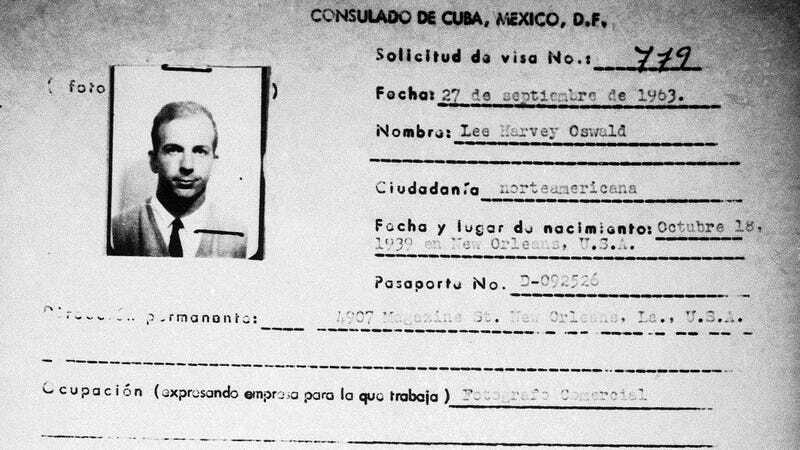 Historians were particularly eager for new details of Oswald’s six-day trip to Mexico City, where he met with Cubans and Soviets two months before the assassination. [And] revelations on Watergate burglars E. Howard Hunt and James McCord, both of whom were longtime CIA operatives of interest to assassination theorists. David Boren, the former chairman of the Senate Intelligence Committee, co-sponsored the 1992 act that ordered yesterday’s release of documents. He told The Washington Post on Friday that it was his intention “that all documents be released in unredacted form except for in the most rare, exceptional circumstances involving current and continuing national security concerns.” Still, in addition to the files that are still under review, 2,800 documents that can now be found on the National Archives website contain redactions or seem incomplete. According to CNN, one particularly intriguing document is a 1975 deposition given to the Rockefeller Commission by former CIA director Richard Helms. A lawyer asks Helms if there is “any information involved with the assassination of President Kennedy which in any way shows that Lee Harvey Oswald was in some way a CIA agent or an agent” and the document cuts off without an answer. In a separate testimony, Helms also said that Kennedy’s successor Lyndon Johnson used to say that he believed Kennedy was shot because of his order to assassinate the president of South Vietnam, Ngo Dinh Diem. Another intriguing inclusion in the cache is a memo from FBI director J Edgar Hoover about intelligence gathered from inside the Soviet Union about that countries’ governmental reaction to JFK’s assassination. The memo indicates that the KGB believed that Johnson was responsible for the plot against Kennedy. In the same memo, Hoover states that the FBI’s source claimed that Soviet officials said that “Lee Harvey Oswald had no connection whatsoever with the Soviet Union” and described him as “a neurotic maniac who was disloyal to his own country and everything else.” But Politico points out another document in the release that details an intercepted conversation between Oswald and Valeriy Vladimirovich Kostikov, a member of the Soviet KGB stationed in Mexico City. Before the documents’ partial-release on Thursday, pearl-clutching pundits like Politico’s Philip Shenon and Larry Sabato warned that any release would be a “fiasco.” The argument goes that between the redaction of documents, the use of code names, and other incomplete information, conspiracy theorists would just find more fuel for their imaginations. They also argued that withholding a portion of the files would “simply cement the idea among the nation’s army of conspiracy theorists that, 54 years after those gunshots rang out over Dealey Plaza, the truth about the assassination is still being hidden.” The fact is, a complete, un-redacted file dump would inspire conspiracies and no release at all would do the same thing. When news broke yesterday that we wouldn’t get the full archive, Wikileaks founder Julian Assange tweeted that “US intelligence agencies seem to be determined to make Trump look weak by delaying JFK files after he promised their release today.” It wouldn’t just be enough for intelligence operatives to want to cover up details about the Kennedy assassination, Assange’s argument seems to go, they also need to make Trump, a transparent and truthful man, look bad. Layers on layers spin in the mind of someone who can’t just accept that sometimes the definitive truth is elusive. On Friday, Wikileaks offered $100,000 for the un-redacted parts of the Kennedy documents. And hey, let’s hope they succeed. We all want to know more. This is some of the most fascinating undiscovered history of the modern age.